THE STORY - Harrelson stars as Wilson, a lonely, neurotic and hilariously honest middle-aged misanthrope who reunites with his estranged wife (Laura Dern) and gets a shot at happiness when he learns he has a teenage daughter (Isabella Amara) he has never met. In his uniquely outrageous and slightly twisted way, he sets out to connect with her. 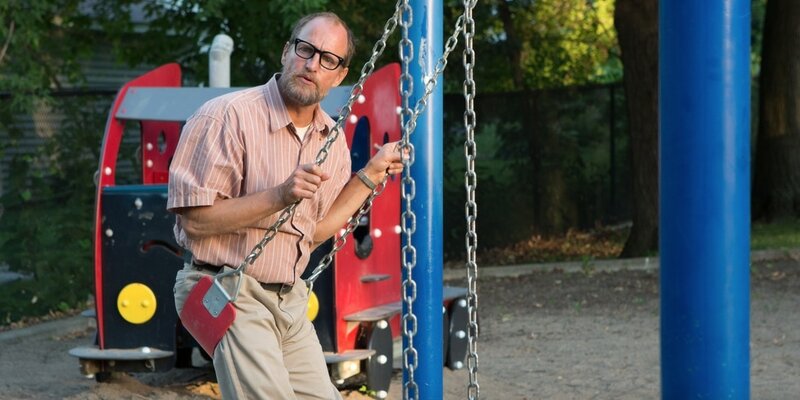 THE GOOD - Woody Harrelson's darkly humorous performance and the film's comedy. THE BAD - The third act is nowhere near as smooth as the first two. ​There were quite a few things that made me want to see "Wilson." It was originally a graphic novel that Daniel Clowes decided to adapt into a screenplay. He has quite the strong track record as he was the man behind "Ghost World," which in my opinion is one of the better coming-of-age movies from the 2000's. It also had Craig Johnson in the director's chair ("Skeleton Twins"), who is also great at capturing the human condition. And having Woody Harrelson was just a plus. The real question though is... Does it make use of its incredible team? For the most part, it does. "Wilson" follows the story of a painfully honest, lonely and seemingly mental unstable middle-aged man of the same name (Woody Harrelson). He doesn't really fit in or understand why other people aren't the biggest fan of him. After finding out that his ex-wife of 17 years, Pippi (Laura Dern) had his baby and didn't inform him. He makes it his business to become the father that he always wanted to be and maybe, just maybe, get another shot at actually being happy. In his own and borderline creepy way, he begins to wish he was actually there for her whole life. At its very heart and soul, "Wilson" is a character study on what these incredible sudden and, for lack of a better word, crazy situations can do to someone and their well being. It's quite interesting to watch it all play out, especially because Woody Harrelson brings his A-Game. I've seen him do an amazing job at playing serious and intimidating characters, even portraying some comic relief ones. However, I wasn't aware that he can blend some serious acting chops together with the film's style of dark comedy. Just like all comedies in the director's previous efforts (Especially the dark ones) there is a lot of hit or miss humor and this is no exception. However, Harrelson has that natural charisma which makes the line delivery a lot smoother and the jokes quite often hilarious. Most of the main cast really have nothing on Harrelson but still offer up very good performances. Something I really appreciate is that the main narrative is executed like it was a graphic novel. What I mean by that is the scenes are executed like a graphic novel. How it bounces from one scenario to the other (Mostly in the first act), you could tell what would be one volume or one strip of the comic. Thankfully, this doesn't compromise the pacing at all due to Clowes writing this in such a way where all these scenes have either a sense of character development or an effect on the overall narrative. What really annoyed me more than anything is that the third act feels extremely rushed after the main narrative is done. We are introduced to this whole other plot involving a relationship between Wilson and Shelly (Judy Greer) that has no development and is just thrown in for the third act. It felt very rushed and I would have much preferred the film being just over two hours long (Or maybe even a bit longer) so it could have unlocked its full potential. This many not be the best movie ever made but I'd definitely say that it is worth watching, at least once. Although the trailer may hint at it, "Wilson" is not a straight-up comedy. Its dark sense of humor is just there to complement the characters seemingly unstable mental state. This movie most likely won't be remembered when Oscar season comes around but I still say it is an enjoyable movie with a lot of respectable features. If you are a fan of Craig Johnson's last feature, "The Skeleton Twins," then I would highly recommend this.